The last time I visited with my Aunt S, she had been in a groove of knitting these ruffled scarves, and she encouraged me to try. She said it was very easy, and the effect was frilly and feminine. I finally decided to give it a try, and purchased a skein of Yarn Bee Chrysalis Metallics in Pipevine Swallowtail. Yes, it is easy – once you get the hang of it. It is also extremely tedious because you have to watch that the yarn doesn’t get twisted and you need to constantly expand the netting. I find that constant attention frustrating, so I probably won’t make many of these. I admit, the scarf does look lovely when completed, and I can certainly understand the appeal. If you are interested in trying this technique, I recommend that you take time to watch this video – the author has a number of good ideas, including how to hold and manage the yarn, and some insight as to how the yarn performs. Instead of the long straight needles, I used size 8 DPNs – you might even go a larger size. I also recommend that you use needles that aren’t “slick” – this yarn is very slippery, and a wood or plastic needle will help you hang onto the project. One video recommend using lifelines in case you drop a stitch – it is almost impossible to recover a lost stitch, otherwise. All-in-all, an interesting project, and (despite the tediousness of it) it only took an evening and a few hours in the next afternoon to complete. I knit the yarn right away – I couldn’t wait! It was only one skein, so wasn’t a big project, but I never posted the results. 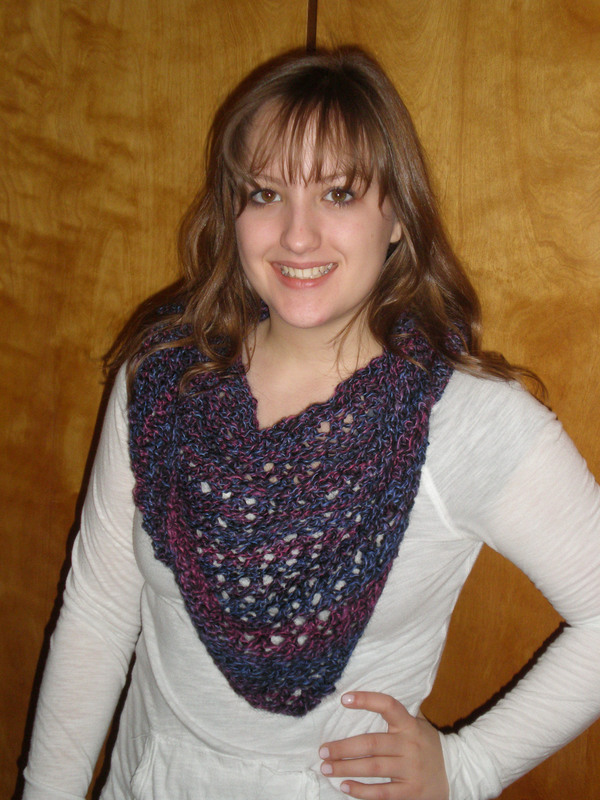 Here you are, a simple shawl/scarf knit in an open framework, modeled by my beautiful daughter. Just got back from a lovely vacation with the Spouse in the Palm Springs area. When we travel, I try to find at least one “local” yarn store to visit – to see what’s popular in other areas, to see what other yarns are available, and because I love yarn stores. I found not ONE, but TWO stores worthy of note. Today’s post will be about The Wool Lady, located in Old Town Temecula. We happened upon this store as the Spouse and I were walking off a day of wine-tasting in Temecula and enjoying the sunset and early evening hours in Old Town Temecula. The store is more than yarn – she specializes in wool fat quarters and also carries embroidery and cross stitch supplies and patterns. She said she got into yarn when a nearby yarn store went out of business. Best of all, she carries locally spun and dyed yarn (some of which she dyes, herself)! The whole back wall of the yarn section was locally-made. Of course, I immediately abandoned the commercial yarns I was perusing and focused my attention on the “local” stuff. Now, if I could just think of what to do with it? Any suggestions? I’m sure you know the feeling of finding a really nice bit of new yarn – hand-spun, hand-dyed, one-of-a-kind, yummy in color and feel. The feeling is intensified when you actually know the artist that created the yarn! Our community held its annual downtown street festival “Moonlight Madness” on Saturday, a feature of which was a Silent Auction hosted by the local chapter of Psi Iota Xi to raise money for their Helping Hand Fund. One of the donated items was a skein of two-ply, Black Mohair and Alpaca yarn, 198 yards, by long-time friend and artist Wyndham Traxler-Carter. She is a “Hand-spinner, weaver and art educator.” Now, I just have to find the perfect pattern to knit it up. I think I found a shawl pattern that might work.